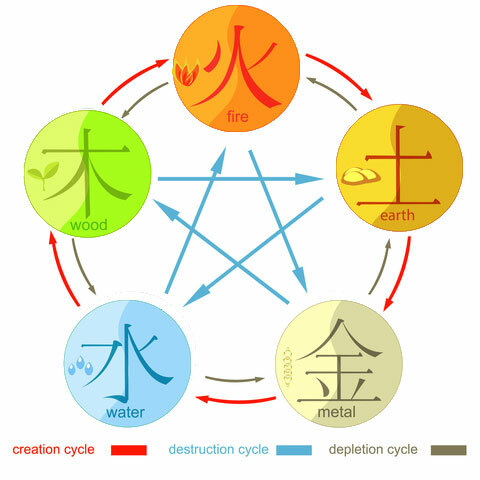 There are five elements in Chinese Medicine: Wood(Spring), Fire(Summer), Earth(Late Summer), Metal(Fall) and Water(Winter). Before we begin, let’s look at the nature of the elements: what are they, why do they exist, what is there function. All ancient systems: Chinese, Yoga, Greek Tibb-Unani, Tibetan, Native American have elements associated with them. The ancients saw them as first principles in organizing energy within us and in nature. They each have a set of unique properties and relate to one another in a dynamic system. It is a way to categorize qualities and when the system is quite developed a way to recognize patterns and prescribe treatments. They have slightly different numbers and categories, yet the similarities of these ancient systems are striking so I think of them as variations on a basic theme. We began this series emphasizing the Water element in Winter, then the Wood element in Spring and now the Fire element. Water nurtures wood by fostering growth of the plant world, and Wood nurtures Fire as fuel for making fire. The ash of fire contributes to the Earth element of Late Summer and within earth exists minerals and metals so a source for the Fall, Metal element. In Buddhist psychology there are the changing elements of perception: six senses, feelings, thoughts and attitudes or dispositions of the mind that all shape perception of experience. And it is this process occurring over and over with uniqueness that contributes to ego formation and personality development. This occurs mostly at an unconscious level. In meditation we open to the framework of sensations, feel them, notice their changing nature and simply see things as they are which is a doorway to seeing things clearly. It opens us up from fixed concepts about the body, our mind, our sense of our self to a direct experience as a changing energy field. This is a powerful antidote to the fixed concept of “I am”: if we experience our body as a play of elements, of different sensations arising and passing away each moment, the changing nature of thoughts and feelings, the passing away of thoughts and recognition that they are not us as they come and go, but rather something that runs through us like a stream or river, then the “I am” consciousness begins to fall away, and it is easier to abide in our body, our hearts, and our mind. There is a natural sense of freedom and liberation so the spirit within us, our Shen, the Heart-Mind in Chinese Medicine, can open out to the world, shine here brightly and beautifully like a flower, be a source of light and substance for others to connect with and fulfill our natural desire to connect with others. The Fire element occurs at the most Yang time of the year. The major solid Yin organ is the Heart, the healthy emotion is Joy, the sound is laughter, the sensory organ is the tongue, the taste is bitter, and it is the ruling organ for the entire system of the body-heart-mind-spirit. There are other organs in Fire that take direction from the Heart. The major hollow Yang organ is the Small Intestine and functions as the minister to the Heart: sorting and organizing all the administrative duties of a running a life in the body-heart-mind-spirit-person-in-society continuum. There are two lesser but very important officials: the Inner Gate which is Yin called the Pericardium or Heart Protector that is associated with the actual sac of the heart and also the sympathetic nervous system, and the Outer Gate which is Yang called the Triple Heater associated with surface Qi or Wei Qi, our first line of defense, and the parasympathetic nervous system. A good leader has consolidated their power, has organized the smooth running of all operations within their domain(Small Intestine does this as the Minister to the Heart), and has established strong boundaries for self-protection, both the Outer Gate as well as an Inner Gate to protect from trespassers who at times breach the Outer Gate. The Heart Protector is concerned about affairs of the heart, our deep emotions, both positive and negative: love and joy but also betrayal and shame especially hurt in situations of emotional, physical and sexual trauma. A central issue here is that of heart break which often causes emotional reactivity that results in the heart closing down. Hurt, disappointment, abandonment, and loss wound us, leave us feeling bereft; the feelings are often intense, overwhelming, and inconsolable. People can go for years with their heart closed off, numb, and disconnected, joyless at a very deep psycho-spiritual level that effects every aspect of their life. Frozen grief, despair, joyless. Often emotionally reactive, easy to anger, distant from people, depleted energetically and cut off from the world, socially and emotionally isolated, angry and bitter. The challenge is to be courageous: to keep opening the heart, allowing oneself to be vulnerable, to risk possibly to be hurt again, simply to open to love. The poet Maya Angelou wisely suggests: “Have enough courage to trust love one more time and always one more time.” The latin root for the word courage means heart, however the meaning connotes bravery, strength, and heroism and is cut off from the heart-love meaning to be from the heart. If you wish to be happy, there is little room for pride, for living life as a victim(although this may be a necessary way station in the process of healing), or for keeping at a distance the connectivity that love brings, the love that is our basic untainted nature. 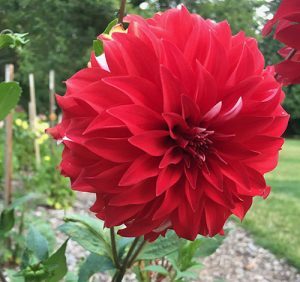 Cultivating compassion for oneself exercises the heart muscle and opens us to the joy that is always already there when our emotional suffering is released. Letting go completely. Letting be. Imagine your heart smiling. It has so much energy with many nerve fibers: it is the source of intuition, the deep knowing that is not left brain, logical; heart energy radiates out very far; it forms an energetic resonance with other hearts. We often speak of being in tune with one another when we relate well. 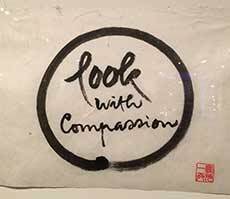 An open heart is a necessary condition for deep healing. If you have difficulty letting go of hurt, disappointment, bitterness, cynicism, anger, resentment, fear of being hurt again if you make yourself vulnerable to relationship, then give yourself permission to seek support and possibly psychotherapy: often the journey to feeling well cannot be done alone, or by reading words of advice and encouragement, or even seeking counsel of loved ones and friends. Being heard, being seen, sensing the caring presence of another all can be a source of solace and deep comfort, softening the armor that shuts down the heart. In progressive stages of opening up to feelings and sensations and emotions and accompanying thoughts in a safe environment, you may be able to relax into a happier, more peaceful state of mind and then sense and feel more connected to all that is around you. Summertime is a time of connection. Sensing the warmth, heat, humidity and dense air of certain climates in Summer, feeling the sweat on our skin as melting liquid between us and the external world. Rather than being annoyed that we are sweating we yield naturally to the experience of literally being connected to the whole Universe, the sense of wonder as we identify with that which is larger than ourselves, the sense of connection to others, joining the large web of connectivity. When our Fire element is healthy, our personal shen, a part of our Spirit, which is also connected to the macrocosmic Shen is clear and bright; we laugh and are joyful with good energy in our face. When unhealthy, there is deep sadness and often the ego is either too ambitious or in poor control: we are not connected to the wider web of life. Sometimes one feels they need to be in control at all times which also disconnects them to the web of life. This often shows up when there has been difficulty in intimate relationships with a history of insecurity or betrayal. In extreme cases of trauma we speak of heart shock where there is terror, confusion, and paralysis. This effects the Heart, the Pericardium and the nervous system. There are different stages of Heart difficulties as they progress from an imbalance to a weakness to excess and complete obstruction: Heart Qi deficiency, Heart Yin deficiency, Heart Yang Stagnation, Heart Yang Fire, so symptoms can vary accordingly from timidity and anxiety and avoidance to increasing degrees of scattered-ness, agitation, mania, depression, and psychosis. Although I have been focusing mainly on mental-emotional issues, on a physical level anything to do with the cardiovascular system is part of the Heart system. And likewise, the Small Intestine on a physical level is important in digestion and supporting the healthy microbiome of trillions of bacteria and yeast in the lumen of our gut, so it plays a critical role in nurturing and protecting our body as a whole. The sympathetic nervous system, Pericardium, when overactive is a source of stress, anxiety, anger and emotional reactivity, and a trigger for psychosomatic health issues. The parasympathetic system Triple Heater, when depleted weakens our immune system and ability to protect ourselves from intrusive, noxious stimuli. The Fire element taste of bitter clears heat and helps us get rid of infection, inflammation, and promotes detoxification. The desire for lighter foods, more raw food, more vegetarian is natural in Summer. There is a lightness about Summer so it is good to avoid heavy foods at this time of year. Being outdoors and physically active is a channel for the Yang energy that is strongest at this time. In yoga to open the heart, backbends will do that, but if you are not ready to feel the emotions in your heart, or if you are injured, you may want to go gently. In the Spring section Baby Cobra pose was presented which is an easy backbend. 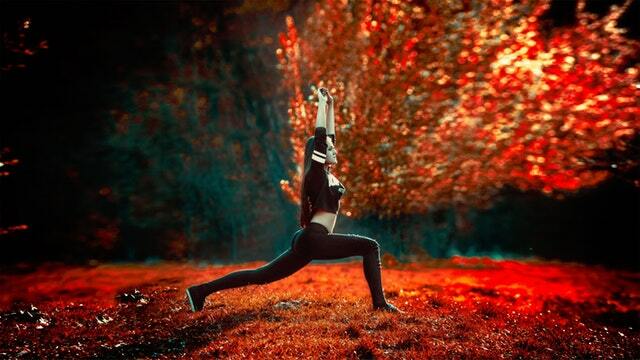 Another not too challenging is Warrior 1 or Virabhadhasana 1, which you would do alternating legs, right leg forward then left leg forward, coming back to standing posture with arms down in between. 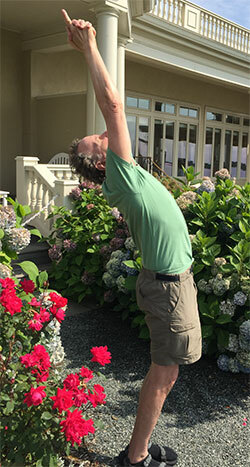 If it is too challenging to hold your arms up just fold them at the elbows behind your back and hold your forearms: the main thing is to lift and open the spine and then gently bend backward to where it is comfortable so you feel the stretch in your spine. Always breathe into the posture, where you feel the tension, and see if you can maintain your focus there rather than drifting into thought or being distracted elsewhere, and in that way you get the full benefit of the asana pose. Backbends are invigorating and up-lifting. Another pose is standing back bend, Anuvittassana: standing with feet together, pulling up the knees with the quadriceps, tip the pelvis forward as this is actually more protective that tucking under, arms straight and overhead with hands clasped and pointer fingers touching, lift up the entire spine, drop the head back, lean back as you push the stomach and lower abdomen and pelvis forward, consciously aware of lifting as you go back. Go back only to your level of comfort. A safer way is to put the hands on the back of your waist with fingers pointing down bending at the elbows pushing into the waist with the upper palms as you lift up out of the pelvis and lean back: in this way you have the support of your hands as you lean back. A very deep way to nourish the heart soul with love is chanting the first line of the Jewish prayer Ahavah Rabah Ahavtanu which translates as “how deeply you have loved us.” This is so important when we feel cut off, especially if having grown up in a situation where parental love was not forthcoming. The lower chakra or root chakra is the one that is mediated by our family and tribe: if there was misfortune we can feel cut off from the larger humanity so we need to draw on other resources as a work around: we don’t need to carry the toxic relationships of childhood that block us from fulfilling our destiny toward wholeness and the vibrancy of being fully alive. The “ah” sound resonates with the heart so “ah…ha…vah…ra…bah…ah…hav…ta…nu” has 8 out of 9 “ah” sounds which makes it strong and powerful. Buddha is unconditional love and by learning to rely only on that and trust only the wish of unconditional love, this becomes your refuge. You realize in trusting the qualities of your mind that brings this out so that this becomes more your life than anything else. And it makes one more willing to renounce and disbelieve the reactive, negative thoughts that shut down the Heart and cut off connection to the greater whole. To see without seeing, to feel without feeling anything particular, to know without knowing, just experiencing, and finally BEING where all of these happen automatically. This is the liminal “in between” state of consciousness, a transcendent state beyond the dualistic thinking of our conditioned mind. Joining us in tranquil embrace. Reminder of vast space between and in all things. Fresh crispness ringing in my ear. My palate hums with sensual delight. All things happily experienced in childhood reconvene. I awaken early to meet you in play. In the light of a glorious day.